Authorities have prevented the festival, Egypt’s signature post-2011 arts fest, from happening in Cairo the last two months. The first time, paperwork problems were cited, as organizers supposedly didn’t have the right permit. The next month, September, Al-Fan Midan’s permit was rejected for security reasons. Al-Fan Midan organizers held a press conference and said that they would continue to hold festivals. Minister of Culture Gaber Asfour also said he supported the event’s continuation. Next week, organizers promise a media campaign in support of the festival. The event has run into previous roadblocks. In April of this year, an Alexandria event was dispersed by police, with organizers and a sound technician arrested on charges of violating the anti-protest law. However, it’s set to return to the seaside city next month. The festival was also on hiatus for two months in 2013 after clashes between pro- and anti-Morsi protesters. 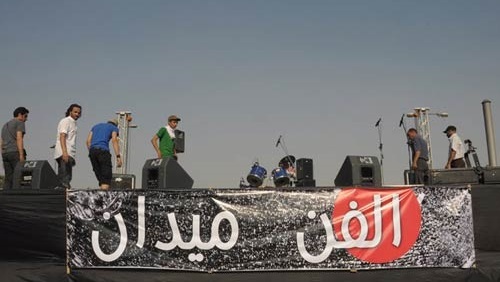 El-Fann Midan was launched in the spring of 2011, soon after the January and February revolt, and is volunteer-run with intermittent funding from the culture ministry. It has staged events in public squares throughout Egypt, including pieces by rising theatre star Laila Soliman, poetry by Zein El-Abdeen Fouad, art by Mohamed Abla. Basma Abdel Aziz’s new book, Memory of Oppression, a Study of the Torture System, was set to be released at the fest this month. The book release had to be rescheduled.